I got into Green Arrow when Kevin Smith brought him back from the dead. Don’t get me wrong, any kid growing up in the early 80’s loved Green Arrow, but mostly as a member of the Justice League of America. No, I started seriously following the character when Smith returned Oliver Queen to the land of the living and then began expanding his cast of characters. Then Meltzer came along with “The Archer’s Quest” and took an already complex character to a whole new level of sophistication. When The New 52 began, I heard that Green Arrow really suffered in terms of story quality. I steered clear. Even as the show on the CW captured my interest, I still kept my distance from the comic book because of its negative reviews. However, when Jeff Lemire came aboard the title, I knew it was time for me to join as well. “The Outsiders War” is a fantastic read. First of all, the mythology Lemire built concerning clans centered upon The Spear, The Sword, The Fist, The Axe, The Mask, The Shield, and The Arrow is something both fresh and unique. 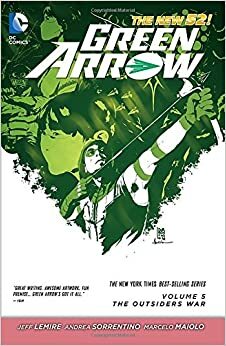 Lemire delivers a fascinating story involving Green Arrow’s past on the island, his father, his half-sister, as well as both Shado and Katana. The repercussions of this story could have lasting effects upon the character for years to come. However, Andrea Sorrentino is an even greater force behind this title. I’ve honestly never quite seen art such as this, and I’ve read comic books for well over thirty years. The layouts, the pictures within pictures, the sheer fluidity from panel to panel – it is the work of an extremely talented person. But, even with that being said, the art is even further enhanced by Marcelo Maiolo, surely one of the most interesting colorists in the industry. If I sat here and described the colors to you, you’d think me insane because nothing is the conventional color you’d expect . But they work. They work beautifully. This entry was posted in Book Reviews and tagged andrea sorrentino, books, comic books, DC Comics, fiction, green arrow, jeff lemire, marcelo maiolo, reviews, the new 52. Chapter 10 – This. This is what I am. Come hell or high water if I deny it I deny everything I’ve ever done. Everything I’ve ever fought for.